STONY POINT – The life and career of Florence Foster Jenkins is told through the charmingly funny play, “Souvenir,” presented at the award-winning Penguin Rep Theatre through September 2. 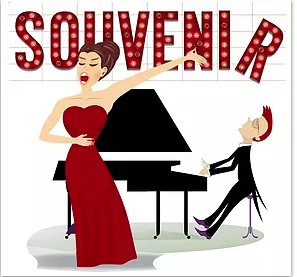 Written by Stephen Temperly and directed by Stephen Nachamie, “Souvenir” tells the story of Florence Foster Jenkins, a wealthy socialite (and actual real-life figure) who became famous for her singing – but not because she was good. Told fondly by her longtime accompanist, Cosme McMoon, the audience is able to devours this two act comedy as they watch the trials and tribulations of a tale full of heart. Jonas Cohen leads the show as Cosme, the ever-talented pianist who moves to New York City to start his career as a musician. Having exceptional timing and wit, Cohen carries the show seamlessly on his shoulders as he sings, plays piano and narrates Florence’s story while never once leaving the stage. Florence is played by the effortlessly charming Deborah Jean Templin. It is impressive that an alum of famous national tours such as “Mamma Mia!” and “Titanic” can believably play a gullible, tone-deaf socialite. Templin brings an instant sense of likability to Florence that makes everyone root for her until the very end. Penguin’s intimate, 108-seat repurposed 1880s hay barn theatre located at 7 Cricketown Road in Stony Point will continue the limited engagement of “Souvenir” through September 2. Following “Souvenir,” Penguin will conclude their 2018 season with the production of “After,” a story examining parenting, bullying and the fallout from a tragic school incident. “After” runs from September 21 – October 14. Penguin will co-produce special presentations “Woody Sez: The Life and Music of Woody Guthrie,” at Rockland Community College’s theater on September 15 and 16, as well as “Lewis Black – In Conversation with Elliott Forrest,” at Rittershausen Theater, 131 North Midland Avenue, Nyack. The playhouse continues to be led by artistic director and founder, Joe Brancato, as well as executive director, Andrew M. Horn. To order tickets or for further information on current and upcoming shows visit Penguin Rep’s website at www.penguinrep.org or call 845-786-2873.